Having a boy and a girl the same age can provide for interesting male/female comparisons. Lately we've noticed that Ned is about the gross motor skills - brute strength. Moving through the playroom like a tornado, pulling toys of shelves, picking up and discarding books from the book bin and crawling around with his blankie in his mouth. He'll climb up when Penny is playing at the music table and pry her hands off so he can move in and take over solo. Penny is more delecate and has better fine motor skills - like softly banging two toys together, learning to put toys "in" to something - include the little "bugs" into the flowers in this new toy I picked up in Target (one of our only "girlie" toys). She likes to hand toys to you (and then take them back of course) and will work long and hard to pick up a tiny scrap off the floor. Ned gives up pretty easily and would rather just flip the toy over. I don't know if it is a male/female thing or if Penny doesn't have the strength for gross motor skills so she is compensating with fine motor and lots of babbling. 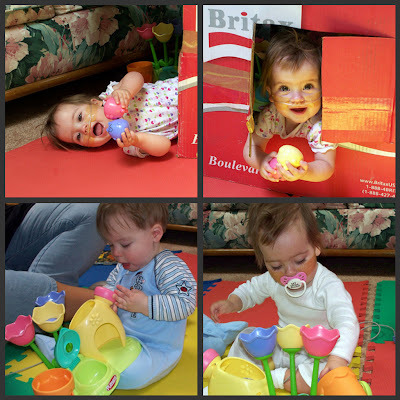 Do you find boys and girls have different play skills? Well, I only have girls and I relate to your comments on both Ned and Penny. They are little tornadoes, up and into everything, especially each other's faces and toys, but they also work on picking small stuff off the floor, clapping hands, babbling (we even have a first word already - Beatriz has been imitating the neighbors' dogs for a couple of weeks). So maybe Penny really just needs to grow a couple more pounds to get going. Does that mean girls are keener on both kinds of skills while boys are hopeless bulldozers? Even at 8 months, I definitely see the boy/girl difference - at leats in that stereotypical sense. Sebastian is also a lot more interested in gross motor skills and Collette is very content to play calmly while sitting on the floor or in a high chair. I have two boys and both can be tornadoes. I might be remembering wrong but I am still surprised at how my 15 mo old has such fine motor skills. Really advanced, while he still trips over a ball when kicking it. My first boy was kicking balls and racing after balls at 11 mos. Different in many ways. My daughter was also great at fine motor, but slow at gross motor. My son (now 10 mos.) is the opposite. He eats books while his sister would use a pincer grasp to turn the pages. But he's cruising all over the place and is such a bruiser. My 12 month old boy/girl twins are definitely gender benders at this point. While Dominik looks like a bruiser because of his size and weight, Scarlett is definitely the Alpha female. While they can both tear through a room in 10 seconds, she's the one who demands whatever toy he is playing with and will use brute force to take it from him. Mostly he cries when she does this, but recently he started biting her. While I obviously discourage biting and hitting, I was secretly a little glad that he finally stuck up for himself. Is that horrible of me? Alex has always been the brute strength one and Nate has always been fine motor. I've always chalked it up to different strengths rather than gender. I think it's more individual and less gender because of the differences in my girls. They're opposite with just about everything, with one exception. They both agree that each of them pulling in opposite directions on the same large blanket is HILARIOUS. Brings the house down every time. I think I'm about 29 years too old to get the joke.